You might have read this title and wondered why anyone would take a 2019 Toyota Highlander Limited off-roading and I didn’t. I understand that the odds are good that no one shopping a new Highlander is concerned with off-roading abilities and I am confident that no one at Toyota would argue that the Highlander is a proper off-road machine. However, many people who buy small crossovers do so in order to safely traverse rough, unpaved roads, so during my week with the 2019 Highlander Limited, I spent a fair deal traveling on the local “natural beauty roads” of Oakland County, Michigan. It comes as a big surprise to many people, but you only have to drive about a half an hour from downtown Detroit to find one of Oakland County’s natural beauty roads. While they have an attractive number, they are anything but beautiful at many points in the year, one of which is the transition from winter to spring. The combination of freezing and thawing with snow, ice and rain and lots of traffic causes huge sections of ruts and pot holes that are harsh enough to shake a vehicle to pieces and deep enough to tear off any low-hanging components. I tried to get pictures, but right now, there is so much water filling the ruts and pot holes that it looks like a smooth road when it is actually riddled with deep obstacles waiting to destroy wheels. A low-slung sedan would be hard pressed to make it a few miles without getting hung up and the people who use their roads daily know that driving on them requires plenty of ground clearance, a good suspension system and, in many cases, four wheel drive. These roads serve as an inconvenient headache for those of us who daily drive performance cars, but they serve as the perfect setting to test a popular SUV that will see more unpaved, dirt roads than off-road parks. 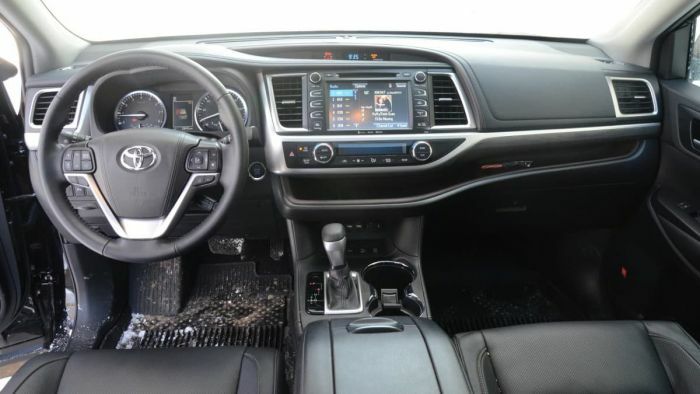 The 2019 Highlander Limited comes heavily appointed for $44,935, including heated and cooled front seats, a sunroof, a JBL speaker system and the Toyota Entune infotainment system with navigation. This infotainment system isn’t going to blow your mind, but it does everything that you need it to do without a whole lot of fuss. The radio is easily adjusted with a pair of traditional knobs, but there are also touchscreen controls and basic controls on the steering wheel, allowing the driver to turn the volume up or down, or flip between radio presets. The three-zone climate control system has its own panel below the touchscreen, which is nice, as you don’t have to dig through menus to turn on the heat while driving. Of course, everything is wrapped in leather, so for a non-luxury model, it has a very premium feel. 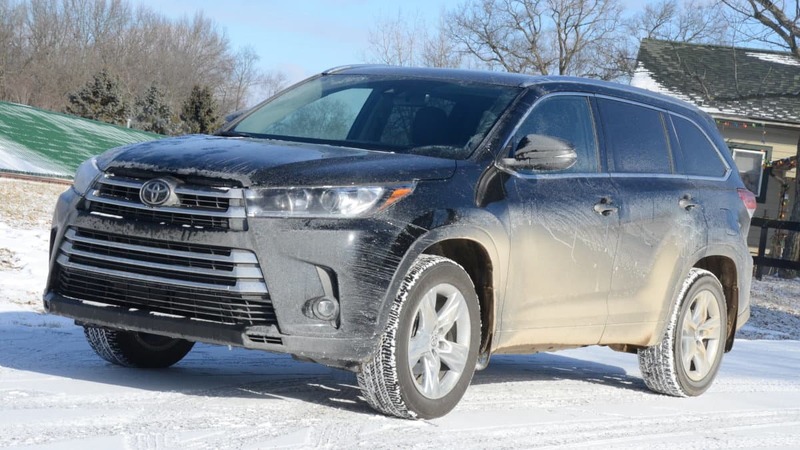 My 2019 Toyota Highlander Limited V6 AWD was powered by the company’s tried and true 3.5-liter V6, sending 295 horsepower towards all four wheels by means of an 8-speed automatic transmission and an advanced all-wheel-drive system. This drivetrain configuration makes the Highlander surprisingly quick on paved roads and when cruising on the highway, I saw figures of 27.1 miles per gallon with speeds hovering around 70 miles per hour. The fuel economy and the basic driving dynamics are what draw many buyers to the popular SUV, as it really is a nice daily driver in normal circumstances. It isn’t going to thrill you with its acceleration or cornering abilities, but on paved roads, the Highlander Limited with the V6 has plenty of acceleration power, it offers a smooth ride and the interior is pleasantly quiet. The Highlander is great on road, but of course it is…that is what it is designed to do best. Like most vehicles of this size, on-road comfort and dynamics are key attributes, but many smaller SUVs and crossovers are terribly out of place when the pavement ends. That is not the case with the 2019 Highlander. The local unpaved roads come in three basic varieties – fairly smooth, rough enough to require most drivers to slow down and rough enough to force most drivers to stop and creep through at a walking pace. The third category is literally rough enough that small cars will get hung up on their chassis, often tearing off things like rear bumpers and exhaust systems, and these situations spring up out of the blue. When you hit these rougher sections as speed, they can bounce the vehicle all over the place, making control at speed difficult, so in addition to trying to preserve the vehicle, drivers slow down for safety. When I first turned into the intricate system of unpaved roads, it was relatively smooth and I had no issue traveling at the 35mph speed limit. There were a few minor bumps and ripples in the road, but the Highlander skimmed across those without any issue. As I got further from paved roads, the dirt got rougher, with more pronounced ruts and the first batches of deep pot holes, but the Highlander still didn’t have any issues. I did slow down a little, as I didn’t want to risk damaging a suspension component, a wheel or a tire, but I had no issue crossing these portions at speed without any concern of control issues. The suspension ate up bumps of the medium-intensity rough roads better than I expected and if not for the worst sections, someone will less regard for the vehicle could confidently navigate these roads at the posted speed limit. The problem is the roughest areas, those which will literally destroy a small car. I have had other crossovers on these roads and many of them struggled with the roughest portions of the natural beauty roads. In some cases, these rough portions are on steep, uphill sections of road, so when you slow down dramatically to prevent slamming into a foot-deep hole, you can find yourself stuck in the mud running through those holes and down the road. The Highlander handled these roughest sections nicely at low speed, so I didn’t have to stop and I was able to clear them without incident, but for the sake of discussion, I found the roughest stretch of road on an uphill climb with loads of mud flowing down the hill and stopped right in the middle. Without any special techniques, the Highlander had no issues getting traction in the mud, climbing up the steep, slippery hill at low speed. I was able to crawl through this section in a way that would have allowed grandma to sip tea in the backseat without ever running into traction issues. A few days later, my area was blanketed in snow, with the frigid temperatures turning the muddy roads into icy paths, covered with fresh snow. I jumped on that opportunity to head back to the worst section of unpaved road to literally see if I could get the Highlander stuck without intentionally putting it into a bad situation. Once again, the midsized Toyota SUV had no problem inching its way up the rough, icy hill just as easily as it had handled the mud. Finally, towards the end of my time with the 2019 Highlander Limited V6 AWD, temperatures went back up above freezing and the rains came down hard, leading to a new batch of muddy, flooded roads. I hadn’t encountered any serious mud or water over the roads on the first few trips, but on the last run down the local natural beauty roads, I found an area where the driving surface was covered in several inches of muddy water that was flowing from one field to another. As was the case in every other unpaved driving situation, the Highlander did a great job of getting through the worst that I could find on local public roads. As someone who regularly travels these roads, the 2019 Toyota Highlander Limited V6 AWD is a vehicle that I would recommend to anyone who spends lots of time driving on rough, unpaved surfaces. The Highlander offers a predictably smooth ride on paved roads, but unlike many vehicles of this size and type, it handles the rough roads almost as well as purpose-built off-road vehicles. 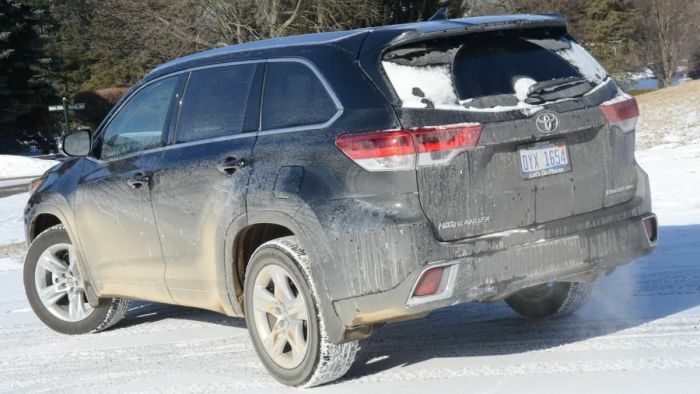 I still wouldn’t recommend that anyone who plans to actually go off-roading put the Highlander at the top of their list, but if you drive in the sunshine, the rain and the snow on rough roads, this Toyota SUV can handle those roads. Refreshing to see a review that takes a real-world look at the performance of one of America's top-selling crossovers. Handling lousy roads a big reason why I buy crossovers and had to quit on sedans and coupes. My '07 Highlander has a full-sized spare on a matching alloy rim. So when your luck runs out on vacation you just continue on and deal with the tire when you have time at home. Excellent, informative review. Thank you. I have drive the XLE on a test drive and also found it quite smooth. Any chance you have had the opportunity to drive the SE with the sport suspension? I live in Alaska and rough, pot-hole laced gravel roads are the name of the game. Any idea if I would be better or worse with a sport suspension?